Freshly milled green lumber has a high water content. For some uses this is OK; but if the wood is going to be used indoors or for woodworking, most of that water will need to be removed. Fortunately, getting rid of the water is not difficult. The drying of lumber can be accomplished in two ways: quick drying in a kiln or air drying outdoors. Air drying takes longer, of course, but requires no energy other than what we get for free from the sun and the wind. So there's both a cost savings and an ecological benefit to this approach. In most cases, the end product will be pretty much the same either way. Air drying requires good air circulation. Lumber stacks need to be built in a way that allows air to move freely around the individual boards and carry the moisture away. This is done by stacking boards in layers separated by spacers called stickers. Lumber should be sticker-stacked soon after milling, within a few days in most cases. Failure to do so may result in staining of the lumber which is caused by microorganisms or chemical reactions in the wood. 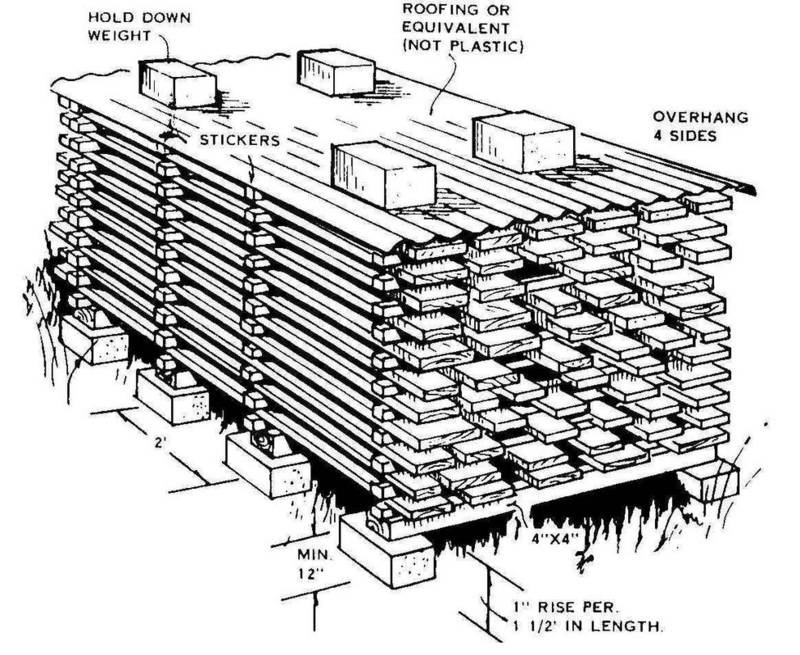 Air Drying of Lumber (pdf, 4,460 KB) is a 66 page report from the US Dept. of Agriculture aimed at large commercial operations, but it still has a lot of useful information for the rest of us. In particular, there's a chart on page 24 which shows the approximate time to air dry 1 inch thick boards of various species of wood. How to Dry Lumber is a 10 minute video hosted on the website of Fine Woodworking magazine. You will need the Adobe Flash Player to view this. The Forestry Forum has a board dedicated to the subject of drying lumber.